Edward Gough Whitlam, AC, QC (born 11 July 1916), known as Gough Whitlam is an Australian former politician and 21st Prime Minister of Australia. After initially falling short of gaining enough seats to win government at the 1969 election, Whitlam led the Labor Party in to government at the 1972 election after 23 years of conservative government in Australia. After winning the 1974 election, he was dismissed in 1975 by Governor-General Sir John Kerr following a protracted constitutional crisis caused by a refusal of opposition Coalition members to pass Supply Bills in the Australian Senate, and lost the subsequent 1975 election. He is the only Australian Prime Minister to be dismissed by the Governor-General, using reserve powers. Although his government spent a relatively short time in office, many of the policies and institutions set up under it are still evident today, such as Medicare. His 'presidential' style of politics, the socially progressive policies he pursued, and the dramatic dismissal and subsequent election loss still arouse intense passion and debate. Gough Whitlam was born in Kew, a suburb of Melbourne. His father, Fred Whitlam, was a federal public servant who served as Commonwealth Crown Solicitor. Whitlam senior's involvement in human rights issues was a powerful influence on his son. Whitlam was educated at Sydney's Knox Grammar School and at Canberra Grammar School, where he became friends with Francis James. Whitlam then studied law at the University of Sydney. During the Second World War he served overseas as a navigator in the Royal Australian Air Force's No. 13 Squadron, reaching the rank of Flight Lieutenant. He completed his studies after the war and was admitted to the New South Wales bar in 1947. On 22 April 1942 Whitlam married Margaret Dovey, daughter of Judge Bill Dovey, and had three sons and a daughter. Margaret Whitlam is known for having a sardonic wit equal to that of her husband and is a published author as well as a former champion swimmer. On the 60th anniversary of their marriage in 2002, he claimed a record for �matrimonial endurance� amongst politicians. Whitlam's impetus to become involved in politics was the Chifley government's post-war referendum to gain increased powers for the federal government. He joined the Australian Labor Party in 1945 and in 1950 was a Labor candidate for the New South Wales Legislative Assembly: a contest he was later grateful to have lost. When Hubert Lazzarini, the sitting member for the safe Federal electorate of Werriwa, died in 1952, Whitlam was elected to the House of Representatives at the by-election on 29 November 1952. Noted since his school-days for his erudition, eloquence and incisive wit, Whitlam soon became one of the ALP's star performers. Widely acknowledged as one of the best political speakers and parliamentary debaters of his time, he was also one of the few in the ALP who could hold his own against Robert Menzies on the floor of the House. Whitlam admired Evatt greatly, and was a loyal supporter of his leadership, through a period dominated by the Labor split of 1955, which resulted in the Catholic right wing of the party breaking off to form the Democratic Labor Party (DLP). In 1960, having lost three elections, Evatt resigned, to be replaced by Arthur Calwell, with Whitlam winning the election for deputy over veteran Labor MP Eddie Ward. Calwell came within a handful of votes of winning the 1961 election, but progressively lost ground from that time onward. The ALP, having been founded as a party to represent the working classes, still regarded its parliamentary representatives as servants of the party as a whole, and required them to comply with official party policy. This led to the celebrated Faceless Men picture of 1963, which showed Calwell and Whitlam waiting outside a Canberra hotel for the decision of an ALP Federal Conference. Prime Minister Menzies used it to great advantage in the November 1963 election campaign, drawing attention to "the famous outside body, thirty-six 'faceless men' whose qualifications are unknown, who have no electoral responsibility." Whitlam was quick to respond, and spent years struggling for party reform�at one stage, dubbing his opponents "the 12 witless men"�and eventually succeeded in having the secretive Labor Party National Conference turned into an open public forum, with state representatives elected in proportion to their membership, and with both state and federal parliamentary leaders being automatic members. Through the 1960s, Whitlam's relationship with Calwell and the right wing of the party remained uneasy. Whitlam opposed several key Labor policies, including nationalisation of industry, refusal of state aid to religious schools, and Calwell's continued support for the White Australia Policy. His stances brought him into direct conflict with the ALP leadership on several occasions and he was almost expelled from the party in 1966 because of his vocal support for government aid to private schools, which the ALP opposed. Whitlam swiftly made his mark on the ALP, bringing his campaign for internal reform to fruition, and overhauling or discarding a series of Labor policies that had been enshrined for decades. Economic rationalism was pioneered, the White Australia policy was dropped, Labor no longer opposed state aid, and the air of grim working-class puritanism that attended the Labor Party of the 1950s gave way to one that was younger, more optimistic, more socially liberal, more intellectual, and decidedly middle-class. Meanwhile, after Holt's disappearance in December 1967, the Liberal Party began to succumb to internal dissent. They first elected Senator John Gorton as leader. However, Whitlam quickly gained the upper hand on Gorton, in large part because he was one of the first Australian politicians to realise and fully exploit the power of television as a political tool. Whitlam won two by-elections, then an 18-seat swing in the 1969 election. He actually won a bare majority of the two-party preferred vote, but the Democratic Labor Party's longstanding practice of preferencing against Labor left him four seats short of bringing the Coalition down. In 1971, the Liberals dumped Gorton in favour of William McMahon. However, McMahon was considered well past his political prime, and was never able to get the better of the more charismatic Whitlam. Outside parliament, Whitlam concentrated on party reform and new policy development. He advocated the abolition of conscription and Australian withdrawal from the Vietnam War, and in 1971 visited the People's Republic of China (PRC), promising to establish diplomatic relations�much to the chagrin of McMahon, who attacked Whitlam for this policy, only to discover that President Richard Nixon was also working toward recognising the PRC. The 1972 federal election saw Whitlam lead the ALP to its first electoral victory since 1946. Custom dictated that Whitlam should have waited until the process of vote counting was complete, and then call a Caucus meeting to elect his Ministers ready to be sworn in by the Governor-General. Meanwhile, the outgoing Prime Minister would remain in office as a caretaker. However, unwilling to wait, Whitlam had himself and Deputy Leader Lance Barnard sworn in as a two-man government as soon as the overall result was beyond doubt, on 5 December 1972, the Tuesday after the Saturday election; they held all the portfolios between them (see First Whitlam Ministry). Whitlam later said: "The Caucus I joined in 1972 had as many Boer War veterans as men who had seen active service in World War II, three from each. The Ministry appointed on the fifth of December 1972 was composed entirely of ex-servicemen: Lance Barnard and me." The full ministry was sworn in on 19 December. Although Labor had a comfortable working majority in the House, Whitlam faced a hostile Senate voted in at the 1970 half-senate election, making it impossible for him to pass legislation without the support of at least one of the other parties � Liberal, Country, or DLP. After 23 years of opposition, the Labor party lacked experience in the mechanics of government. Nevertheless, Whitlam embarked on a massive legislative reform program. In the space of a little less than three years, the Whitlam Government established formal diplomatic relations with the People's Republic of China; assumed responsibility for tertiary education from the states and abolished tertiary fees; cut tariffs across the board by 25% and abolished the Tariff Board; established the Schools Commission to distribute federal funds to assist non-government schools on a needs basis; introduced a supporting benefit for single-parent families; abolished the death penalty for federal crimes. It also reduced the voting age to 18 years; abolished the last vestiges of the White Australia Policy; introduced language programs for non-English speaking Australians; mandated equal opportunities for women in Federal Government employment; appointed women to judicial and administrative positions; abolished conscription; set up the National Aboriginal Consultative Committee; amalgamated the five separate defence departments; instituted direct federal grants to local governments, and established the Order of Australia (Australia's own honours system), as well as improved access to justice for Indigenous Australians; introduced the policy of Self-determination for Indigenous Australians; advocated land rights for Indigenous Australians; increased funding for Indigenous Australian's welfare; introduced the Multiculturalism policy for all new migrants; established Legal Aid, and increased funding for the arts. The repeated rejection of these bills provided a constitutional trigger for a double dissolution (a dissolution of both houses followed by an election for all members of both houses), but Whitlam did not decide to call such an election until April 1974. Instead, he expected to hold an election for half the Senate. To improve his chances of winning control of the Senate, Whitlam offered the former DLP Leader, Senator Vince Gair, the post of Ambassador to Ireland, thus creating an extra Senate vacancy in Queensland which Whitlam hoped Labor could win. This manoeuvre backfired, however, when the Queensland Premier, Joh Bjelke-Petersen, learnt of the scheme and advised the Governor of Queensland to issue the writs for the Queensland Senate election before Gair's resignation could be obtained. This "Gair affair" so outraged opponents of the Whitlam government that the Opposition Leader Billy Snedden threatened to block supply in the Senate, although he took no actual steps to do so. Whitlam, however, believing Snedden was unpopular with the electorate, immediately went to the Governor-General, Sir Paul Hasluck, and obtained a double dissolution of both Houses on 11 April, with the election set down for 18 May. Whitlam went to the polls asking for a mandate to "finish the job", and the ALP campaigned on the slogan "Give Gough a Go". At the election the Whitlam government was re-elected, though with a reduced majority. The DLP lost all its seats, but Labor failed to win a majority in the Senate. The balance of power in the Senate was now held by two independent Senators. In the short term, this led to the historic joint sitting of both houses, at which the six bills were passed. In the longer term, it contained the seeds of Whitlam's downfall. In its second term, the Whitlam Government continued with its legislative reform program, but became embroiled in a series of controversies, including attempts to borrow large amounts of money from Middle Eastern governments (the "Loans Affair"). Whitlam was forced to dismiss Treasurer Jim Cairns and another senior minister, Rex Connor, for misleading Parliament. The crisis of 1975 might not have occurred had the Senate as elected in 1974 maintained its member status. The crisis was precipitated by the Senate delaying the Whitlam government's money (Supply) bill. Although one of the two independents, Michael Townley, joined the Liberal Party, the other, Steele Hall, was opposed to blocking supply, and this would have been sufficient to prevent such a course being followed. The change in the composition of the Senate which made the constitutional crisis of 1975 possible was brought about by two appointments to fill casual vacancies in the Senate, which under Section 15 of the Australian Constitution are made by the State Parliaments 'if sitting'; or otherwise by the State Governor 'with the advice of Executive Council'. Since the introduction of proportional representation for Senate elections in 1949, there was a convention that Senators who died or resigned should be replaced by a Senator of their own party, and until 1975 state governments had adhered to this convention. The practice in Queensland, however, which was established in 1952 by Labor Premier Gair when a Liberal senator died, was for the opposition to provide a list of three names and for the Premier to be able to select one of them. In February 1975 the Premier of New South Wales, Tom Lewis, broke with convention by appointing an independent Senator, Cleaver Bunton, to replace the Attorney-General, Senator Lionel Murphy, who had been appointed to the High Court of Australia. This appointment made no difference to the political situation, because it turned out that Bunton was opposed to blocking supply, but it provided a precedent for the Queensland National Party Premier, Joh Bjelke-Petersen, when a Queensland ALP Senator, Bert Milliner, died on 30 June. As permitted by Section 15 of the Australian Constitution, Bjelke-Petersen refused to appoint the ALP's chosen replacement, Dr Mal Colston, and asked Labor for three alternative nominations, as Gair had requested of them in 1952. Bjelke-Petersen said he had concerns over Colston's integrity, but Labor maintained that his real intention was to appoint a Senator who would support the blocking of supply and thus help bring down the Whitlam government. Field was granted leave from the Senate when High Court writs were filed challenging his eligibility to sit, on the grounds that he was in Crown employment at the time of his appointment. (Field had been employed by the Queensland Education Department, and although he had resigned the day before he was appointed, he was required by the Education Act to give three weeks' notice). But the change to the composition of the Senate was in any case decisive, because with Milliner's vote gone, the Opposition could pass Senate motions 30 votes to 29. Rather than blocking supply, they moved to delay consideration of the budget. This delay would have resulted in essential public services ceasing to function due to lack of money; that is to say Whitlam attempted to govern without supply and no government had ever attempted such a course of action (Weller & Smith, The Rise and Fall of Whitlam Labor - full citation below). Fraser warned that the bill would not be passed unless Whitlam called an early election. Whitlam was determined to face the Opposition down, and proposed to borrow money from the banks to keep the government running. He was confident that some of the more moderate Liberal Senators would back down when the situation worsened as appropriations ran out during November and December. Kerr was also advised, by New South Wales Governor Sir Roden Cutler that he must warn Whitlam of the possibility of his dismissal. On hearing the proclamation dissolving Parliament, which ended with the traditional 'God Save the Queen', Whitlam delivered an impromptu address to the crowd that had gathered in front of the steps of Parliament House. During the speech he labelled Fraser as "Kerr's cur" and told the crowd: "Ladies and gentlemen, well may we say 'God Save the Queen', because nothing will save the Governor-General." In the House of Representatives, following Kerr's actions under Section 64, Whitlam moved a motion 'that this House expresses its want of confidence in the Prime Minister and requests Mr Speaker forthwith to advise His Excellency the Governor-General to call on me to form a government'. This vote of confidence in Whitlam was passed on party lines. News of this vote was delivered personally to Kerr by the Speaker of the House Gordon Scholes, but Kerr refused to see the Speaker until after his Official Secretary had read the notice of double dissolution at Parliament House at 4.45 pm. (Weller & Smith, Ibid.) Many unions mobilised and prepared to strike but the President of the ACTU Bob Hawke called for unions not to be provoked. Although there were a number of public protests against Fraser during the campaign, the media (especially the Murdoch press, which had supported the ALP in 1972) had long since lost confidence in Whitlam, reporting a string of ministerial failures. This had a major influence on public opinion, signalled some months previously in the Bass by-election and the election resulted in a landslide win to the Coalition. During its three years in power, the Whitlam government was responsible for a long list of legislative reforms, some of which still stand today. It replaced Australia's adversarial divorce laws with a new, no-fault system; introduced the Trade Practices Act; slashed tariff barriers; ended conscription; introduced a universal national health insurance scheme Medibank, now known as Medicare; gave independence to Papua New Guinea; made all university education free to its recipients; introduced needs-based federal funding for private schools; established the long-awaited "third tier" in Australian radio by legislating for the establishment of community-based FM radio (commercial FM radio would be established under his successor Fraser); and established diplomatic and trade relations with the People's Republic of China. However, Whitlam's critics point to substantial failings in his administration. The economy declined, with adverse balance-of-payments problems, high unemployment and (by Australian standards) very high inflation and bank interest rates. External factors contributed to this, in particular the 1973 oil crisis and resulting higher world oil prices, and falling prices for Australian farm produce. But the Whitlam government's own economic policies�such as its controversial 1973 decision to reduce tariffs across the board by 25%�were also held partly responsible. On social matters his reputation has been tarnished by his complicity in refusing to act against the pro-separatist movement on Bougainville on 1 September 1975, just two weeks before PNG independence on 16 September 1975; allowing Indonesia to invade Portuguese Timor on 7 December 1975 and later annex the territory (although the invasion of Dili occurred the month after his dismissal, the "covert" military campaign across the Indonesian border had begun in October). Whitlam also refused to allow South Vietnamese refugees into the country following the fall of Saigon in 1975, concerned that they would have anti-communist sympathies hostile to the Australian Labor Party. The autocratic Whitlam's "crash through or crash" style made many political enemies, and the various scandals afflicting the government cost it electoral support and momentum. His 'crash through or crash' style was also his Achilles heel surrounding the lead-up to the dismissal (J. Walter, The Leader see full citation below). Some Australians regarded his dismissal by the Governor-General as an outrage, but the Australian electorate voted to replace the Whitlam government by a record margin, and the Labor Party would not be a serious candidate for government again until Whitlam was replaced as leader. The Whitlam government was also greatly damaged by several highly-publicised scandals, most notably the disastrous "Loans Affair" masterminded by Rex Connor, the series of controversies over the questionable conduct of Treasurer and deputy party leader Jim Cairns, and the Indonesian invasion of East Timor. However, Whitlam's book The Truth Of The Matter recounts legal steps essayed in the attempt to obtain or bypass parliamentary supply. Whitlam stayed on as Opposition Leader. The Whitlams were visiting China at the time of the Tangshan earthquake in July 1976. Although they were staying in Tientsin, 90 miles away from the epicentre, Margaret Whitlam was still slightly injured. Whitlam fought the 1977 election but Labor was defeated nearly as heavily as it had been in 1975. On election night he announced his immediate retirement as Leader of the Opposition, and he resigned from Parliament in 1978. After a few years as a travelling lecturer, he was appointed Australian Ambassador to UNESCO by the next Labor Prime Minister, Bob Hawke. Although Whitlam knew this was partly a ploy by Hawke to get him out of the country, he hugely enjoyed the Paris posting and made a great impression on other UNESCO delegates. He has published several volumes of memoirs. The Labor historian Bob Ellis has described him as "the self-appointed deity of the Labor Party". The sole issue over which he has received sustained criticism from the left is his failure to oppose Indonesia's plans to annex East Timor, then Portuguese Timor. Whitlam turned 80 in 1996, but still made regular public appearances and continued to comment on some issues, notably republicanism: in the 1999 referendum, he campaigned together on this issue with his old enemy Fraser. He felt the Hawke government had wasted its opportunities to continue the Whitlam reform program, but was more enthusiastic about Paul Keating's government. After 1996, he was scathingly critical of John Howard, but also of Kim Beazley, who was Labor leader from 1996 to 2001 � this feud apparently went back to Whitlam's dislike of Beazley's father (Kim Beazley, senior), who had been a minister in Whitlam's government. Whitlam was delighted when his former research assistant and then-MP representing his old seat of Werriwa, Mark Latham, was elected Labor leader on 2 December 2003, exactly 31 years after Whitlam's own election as Prime Minister. By that time Whitlam, 87, was increasingly frail and usually appeared in public with a walking stick, but his ability and willingness to make outspoken comments had not diminished, and he spoke frequently in praise of Latham. 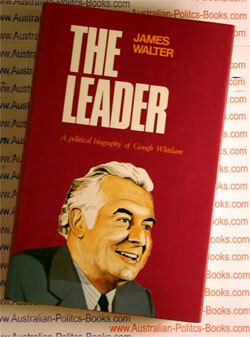 In April 2004, Whitlam spoke at a function marking the centenary of the Watson Labor government. Later in the year he appeared at Labor events during the unsuccessful 2004 federal election campaign, and appeared to be in good health. Latham's diaries, however, were published in September 2005, and included a claim that Whitlam had dismissively remarked to Labor MP Joel Fitzgibbon that he thought Latham�who had by then resigned as leader�should quit politics altogether. When Latham learned of the remark, he cut off all contact with his former mentor and described Whitlam's comment as "the cruellest cut of all". Whitlam subsequently claimed that he simply told Fitzgibbon he thought it was "unsustainable" for Latham to stay on as an MP because of his ill-health. In November 2005, he donated his letter of dismissal and his copy of the "It's time" campaign speech to the University of Western Sydney. A member of the Australian Fabian Society, Whitlam was its President in 2002. Whitlam has been a supporter of fixed parliamentary terms since his membership of a constitutional review committee in the 1950s. A week before his ninetieth birthday he accused the ALP of failing to press for this reform.